Microsoft has announced the new Surface Pro 2 tablet, its first of two devices which the company will announce today. Touted as “literally 95% faster than laptops today”, the Surface Pro 2 is the latest product in the company’s popular Surface lineup. The new Surface Pro 2 tablet has had significant hardware improvements all around. There’s lots of performance increases in terms of performance, such as 46% increased colour accuracy on the 10.6-inch Full HD ClearType HD display, 50% improved graphics, and a 20% overall performance boost over the first Surface Pro tablet. Specifically, the Surface Pro 2 will pack an fourth-gen Intel Core i5 processor, and will be available in 64GB and 128GB storage options with 4GB of RAM, as well as a 256GB or 512GB model with 8GB of RAM. On top of that, with the new Haswell chips, the Surface 2 Pro now offers a massive 75% increased battery life. And, if that’s not enough, there’s the new Power Cover, which includes a 30wh battery for increased productivity times. In addition, Microsoft has also added a new Surface accessory: the Surface Docking Station. Capable of powering two monitors, the Surface Docking Station also adds more connectivity ports, such as 4 USB ports (1x USB 3.0), Mini DisplayPort, Ethernet, audio in/out as well as AC-in. On the tablet itself, there is a microSD card slot, USB 3.0 port and a mini DisplayPort. Incredibly, the processing power on the Surface Pro 2 is also capable of processing raw 6K footage. Yup, not just 4K video, but 6K video…on a tablet. The Type Cover keyboard has also been updated, and is now called the Type Cover 2. In addition to new colours, the Type Cover 2 is also 1mm thinner than last year’s model, and is also backlit. 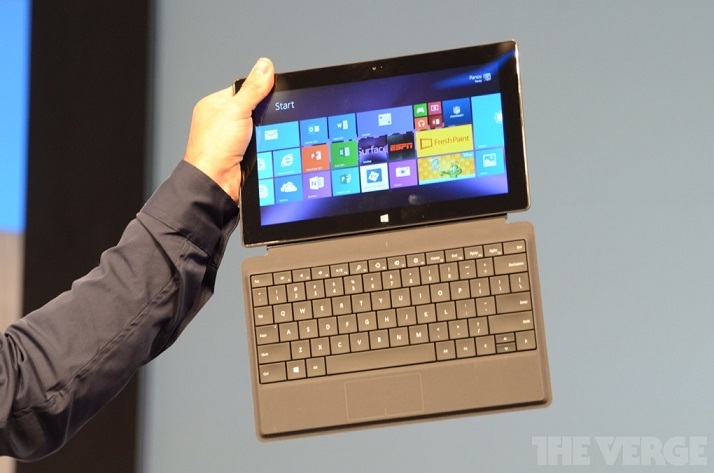 Microsoft also touts better “lapability” on the Surface 2 Pro. There’s a new two-stage kickstand on the tablet, where the first stage will prop the tablet in laptop mode, while pushing the kickstand further will lock it in a 55-degree angle that is more ideal for use when placed on the lap. As for pricing and availability, Microsoft has priced the Surface Pro 2 starting from $899 (around RM2820). All purchases of the Surface Pro 2 will come bundled with 200GB of SkyDrive cloud storage for two years, as well as the “Best of Skype” package: one year’s worth of free international calls as well as Skype WiFi hotspots. The Microsoft Surface Pro 2 tablet will be available from October 22 in 21 selected markets around the world: Australia, Austria, Belgium, Canada, Denmark, Finland, France, Germany, Hong Kong, Ireland, Italy, Luxembourg, the Netherlands, New Zealand, Norway, Portugal, Spain, Sweden, Switzerland, UK, and the US. In the meantime, find out more about the new Surface Pro 2 tablet at its new official website here.